Back in the day, Rockstar San Diego — best known for Red Dead Redemption of course — was Angel Studios, a work-for-hire developer responsible for the N64 port of Resident Evil 2 among other games. What you may not know was the studio had an internal division known as Dream Team that once worked on an unreleased N64 game with none other than Mario creator Shigeru Miyamoto. 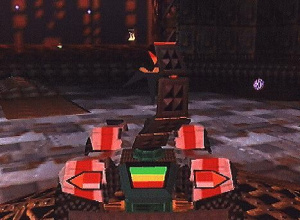 Buggie Boogie was "a DNA-based driving game" according to former Angel Studios employee Clinton Keith. You had these vehicles that would eat other vehicles and adopt their powers and morph. It was really cool. But they [Angel Studios] would sign three month contracts, and Miyamoto himself would say that he did not want any documents. He would just say, "Find the fun, and I'll be back in three months to take a look at what you have." Eventually Miyamoto and Nintendo canned the game, moving the developer onto a fantasy golf game that also never saw the light of day. Miyamoto and Angel Studios worked closely together for five years, though no original Nintendo-published games came out of the team in that time. T_T I would have loved to play that. WOW, I remember seeing a picture or two of this in the first magazines that showed the first pictures of the N64 (then-Ultra 64 in the US) and games (jaw just dropped at those first pics, especially Super Mario 64). I've not thought of that would-be game for probably over 15 years until seeing this article. Maybe a Buggie Boogie revival for Wii U or 3DS? @Kage When you put it that way it sounds like Kirby Airide for Gamecube. wooow. i remember seeing screenshots of this too, in an old magazine!! How far did they get into development?